After he took power, 862 people were killed. The charges come at the end of a long-running investigation. The two other men charged are former Deputy Prime Minister Gelu Voican Voiculescu and former Air Force Cdr Iosif Rus. No date for the trial has yet been set. "It is a particularly important moment for Romania's justice system that is fulfilling a debt of honour to history," Chief Prosecutor Augustin Lazar told reporters. Prosecutors accuse Mr Iliescu and Mr Voiculescu of "directly spreading misinformation through televised appearances and press releases, contributing to the institution of a generalised psychosis". Mr Rus is accused of ordering an air force regiment to change its insignia, which led to friendly fire that contributed to the deaths of 40 soldiers and eight civilians at Otopeni International Airport, Balkan Insight reports. 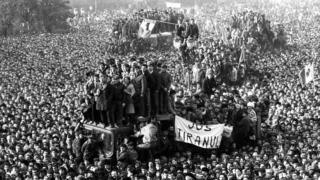 Mr Iliescu had been a minister in the government of Nicolae Ceausescu, and went on to lead the National Salvation Front, which took control of the country after the uprising which began in the western city of Timisoara in December 1989. Mr Voiculescu also denies wrongdoing, calling the prosecution "an act of political revenge".